(02/07/2015) The Aujan Coca-Cola Beverages Company (ACCBC), one of the leading beverage industry players in the Middle East and North Africa, today revealed its significant expansion plans across the region. The company will invest US$500 million into the beverage industry within the next three years, including a series of capacity improvements, innovations in new packages and consumer occasions, as well as IT infrastructure upgrades. Speaking on the sidelines of Gulfood, Nicolaas Nusmeier, Chief Executive Officer, ACCBC, said: “Robust expansion plans will enable ACCBC to realize the vision of its shareholders across the Middle East and North Africa. We already have a portfolio of strong brands, and an excellent track record as a regional beverage operator. 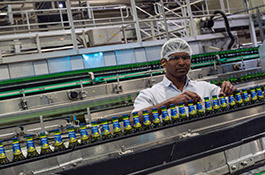 Major investments in capacity, geographical coverage, and brand development will allow us to capitalise on the growth potential for the beverage industry in the MENA region. “Despite political and economic disruption over the past few years, the regional beverage market has continued to grow, and we expect this to continue. In 2014, ACCBC delivered double-digit volume growth. ACCBC also completed the acquisition of a majority stake in the National Beverage Company S.A.L. (NBC), the manufacturer and distributor of Coca-Cola, Pampa, and several other brands in Lebanon. The acquisition reinforced ACCBC’s long-term commitment to the Levant region, and demonstrates the value of the growth partnership with the Coca-Cola system, enabling NBC to achieve necessary scale through access to ACCBC’s extensive sales and distribution expertise. In addition, ACCBC confirmed plans announced in 2014 to invest in a state-of-the-art factory in Egypt which will supply ACCBC’s brands to the Egyptian market, with expansion potential across other African markets. In Algeria, the biggest juice market in Africa, volume of ACCBC’s flagship brand Rani has grown over 300% within the last four years. “We believe that Rani can achieve market leadership in Algeria within the next 3-5 years,” Nusmeier confirmed. ACCBC is participating at Gulfood 2015 from 8 -12 February, with a stand located on the concourse in front of Hall no. 8, at Dubai World Trade Centre. ACCBC along with Rani Refreshments (RR) – the global trademark owner of Rani and Barbican were established in 2012 following The Coca-Cola Company’s successful acquisition of 50 percent of Aujan’s beverage business.